Markegard Family Grass-Fed: Support us with edible credits. 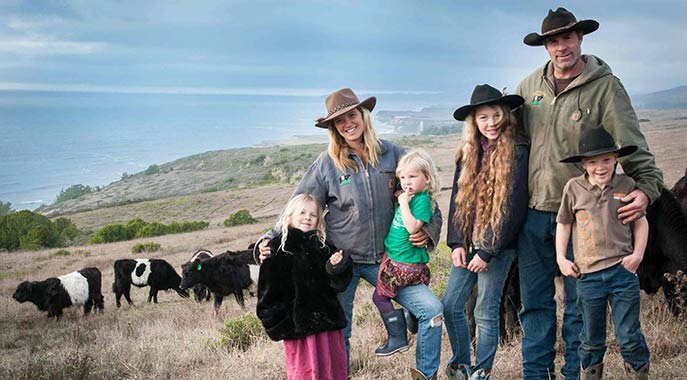 Erik and Doniga along with their 4 kids ranch in the coastal hills of San Mateo and Sonoma Counties. The Markegard’s do their part in the vibrant local food community by stewarding the watersheds they manage through mimicking natural systems with their regenerative agriculture practices. Markegard Family Grass-Fed provides the community with locally born, raised certified grass-fed beef and lamb, pasture raised pork and chicken as well as habitat for wildlife both above and below the surface of the Earth. Doniga Markegard comes to ranching with a background in wildlife tracking and permaculture. Erik Markegard is a 6th generation cattle rancher. Doniga’s and Erik’s deep observation experience aids in their ability to monitor grassland health, biodiversity and to manage land based on the principles and patterns found in nature. They are passionate about finding ways to regenerate lands and community through ranching practices that build soil, sequester carbon, capture and purify water and enhance habitat. They have an immense passion for the natural world and helping others live a life of balance with the Earth and all living things, leading a life of example where her own actions are deliberated into the health of the future generations. Erik started his own cow/calf business, Flying M Cattle Company in 1985. Two years later he started managing and then leasing the TOTO ranch. When Erik met his wife, Doniga, they transformed the cow/calf operation into 100% grass-fed to meet the growing demands for healthy, local, sustainably raised beef. Consider becoming a member of our Markegard Family Grass-Fed Meat CSA. The Markegard Family Grass-Fed Meat CSA is our version of Community Supported Agriculture. We work hard at being a sustainable family business and we need the help from our community in order to continue to provide your local source of food. By giving us a commitment of $300 or more we know that the meat we produce will have customers awaiting the arrival of the boxes back from the butcher. This helps us plan for what our customers want and plan our production. We also love your feedback and by being a committed customer you are part of the ranch family. Some of the perks of joining include: Participate in Members Only Family Ranch Days and have a fun day taking part in some ranch activities. Have first access to seasonal products, and members only specials. Experience first-hand the seasonality and connection to local food.